I only live about an hour and a half's drive from Bloomington, Indiana. It's an easy day trip. It's a wonderful "real" college town (as opposed to an ordinary town which happens to have a college in it), with great shopping, dining, entertainment, and an attractive campus. If I could live anywhere in Indiana, it'd be Bloomington. As we approached the hotel, I was supposed to be navigating, but I got distracted by the fabulous lace-covered tree at right. In fact, the downtown Bloomington Entertainment and Arts District (BEAD) was full of tree sweaters! A little Googling turned up the reason: it's a fundraising project for domestic violence victims. You can see all the trees and read about the Knitting to Heal project here. 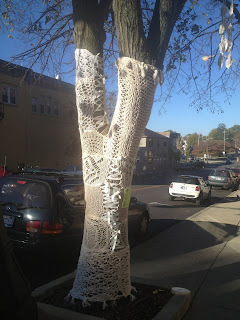 Another of my favorite trees was, unsurprisingly, sponsored by a local yarn store, Yarns Unlimited. 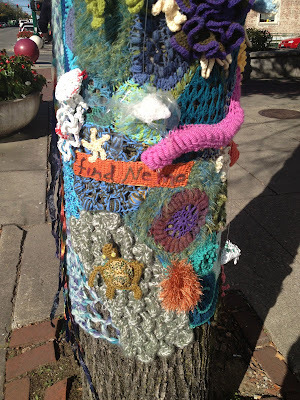 I wish I had a 360-degree draggable panorama to show you all the charming knitted and crocheted sea creatures!